When a restaurant's address covers four street numbers, you know you're dealing with an institution. And with interstate friends in town and a Comedy Festival show to catch, you know you can't go wrong settling in at Stalactites for a speedy serve of solid Greek food. The dine-in menu is long, but as the cuisine on offer is so iconic, we all found it easy to simply hunt out our Hellenic dish of choice. Both the chaps at dinner went for the mixed grill. And frankly, why wouldn't you? 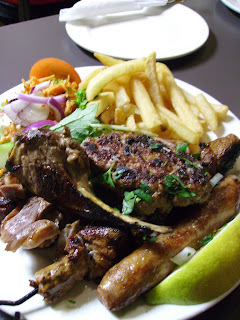 $22 gets you more ovine and cattle on a plate than most sensible people could eat in a sitting: marinated lamb skewer, marinated giro, lamb chop, rissole and sausage. And just to be sure you supplement all that protein with both salt and vegetables, the grill comes with chips and Greek salad. 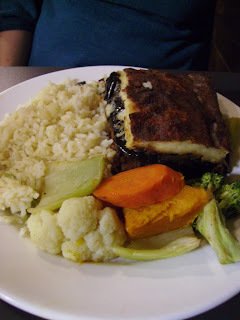 The Greek staple, moussaka, is expectedly dense. The eggplant is baked almost to the colour of the mince, and they both support a thick layer of potato, which has soaked up the bechamel sauce. To add even more weight, the dish comes with rice and baked vegetables. It's incredibly filling and full of the flavours endemic to Greek cooking. Having had just such a craving earlier in the day, I looked no further on the menu than the kalamari. 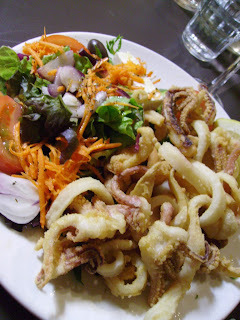 The dish is a mixture of squid and octopus, so tentacled pieces nestle amongst tender squid strips. The flesh is a bit hit and miss: some pieces soft and biteable, others tougher. Some bore slightly too close a resemblance to the live animal, and hence were used only for portraiture, and spared the eating! The accompanying Greek salad was nicely dressed, with two token olives and a small wodge of fetta. Masterfoods tartare sauce accompanied the fish: not my first choice of dressing. 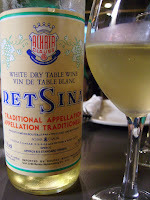 We also had a bottle of retsina. My only other experience with Greek table wine was on the island of Paros, demolishing a very cherry-ish bottle of red on the beach in betw een taking an inordinate number of photos of the sunset. 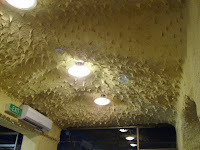 Many, many moons ago, the Greeks sealed their wine vessels with pine resin, and although barrels and glass bottles now adequately perform the task of keeping air out, the resin flavour is still added to the wine. It was a bit of a shock! The flavour improved (ie settled) somewhat after the wine had sat in the glass for a while. The Comedy Festival show was Daniel Kitson, a very funny and intelligent man, who I heartily suggest you check out. 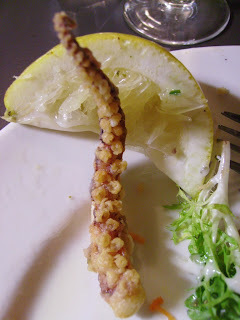 Squids have tentacles too, not only octopus...and from the look of it that is 100% squid. I confess to an ongoing confusion with the nomenclature of molluscs...and I think plenty of menu writers are in the same boat! Any tips on visual differences between an octopus and a squid tentacle?